So this is a continuation of the last post, where I spun 40 grams of fibre onto my Jenkins Swan. I wound the turtle in that neat and tidy way that I saw most spindlers on Instagram doing. They are lovely. However, I discovered that when I removed the shaft and arms, the edges started to peel away. I had noticed this on several earlier occasions, but just figured that I was somehow doing something wrong in my wrapping. Not this time. I paid close attention. The quality of this photo is awful and I apologize for that. However, You can see the layers clearly coming apart. So here they are side by side. The random wind-on is on the left. The carefully wound one is on the right. For plying I made a two-stranded ball and to assist me in this I put the turtles into our French Onion Soup bowls. They are the perfect size and heavy. Things went well for the first half, but as the centre hole got larger, the yarn from the carefully wound turtle started coming out in clumps. I think the fibres stick to each other when they are carefully wound like that. Here’s an 80 gram double stranded ball that I plied using my Snyder Steampunk spindle. It’s my go-to spindle for plying. It’s heavy, fast and I can get a lot of yarn onto it. There’s 80 grams on this baby. Measured out at 192 yards or 177 metres. The moral of the story? Carefully wound turtles, while beautiful, take longer to wind and are not solid stable balls. In the singles stage when the twist is really active, you want as much stability as you can get. This entry was posted in drop spinning, spindling, steampunk and tagged Turkish spindle, Turkish spindles on April 2, 2016 by DianaTwiss. I love spinning, especially spinning on my spindles. They are beautiful tools and I take any excuse to spend time with them. I love all kinds of fibres, but especially the variety of wool we have available to us these days. It seems though there are not enough hours in a day to play with spindles, play with fibres, make yarn, and then do something with it, like knit. I figured that I needed to start spinning faster. What would it look like if I only worked on one project from start to finish? And during that period, tried to spin as quickly and as efficiently as possible? How fast is fast? At least for me. I work full time, Monday to Friday. So my fibre arts happen in the evenings and on weekends. On Wednesday evening I pulled out the March 2015 Sweet Georgia Yarns (SGY) fibre club installment. It was a 100g braid of 100% corriedale – the colourway is Beginner’s Luck. This is the fibre opened up so you can see the colour way. It’s blue with several gradations of green. All the colour changes are gentle and not dramatic. I decided that I wanted the colours to blend as much as possible, so I split the entire roving in half, weighed them to make sure I’d have equal amounts, then split the fibre further into pencil rovings and started spinning. It took Wednesday and Thursday evening to fill spindle one. And Friday to spin spindle two. On Saturday morning I wound the singles from both spindles into a double stranded ball for plying. And brought out my Steampunk spindle by Scott Snyder for the job. I wanted to try to make one skein of plied yarn. And here is the spindle, as filled with yarn as you could get. It was getting heavy and I was in danger of running out of shaft to spin. After plying I let it sit overnight and this morning wound it off into a skein. I knew exactly what I wanted to do with this yarn, how I wanted to spin it and how I wanted to play with the colourway. I wasn’t making decisions every time I picked up the fibre. The experimenting was over and I was just down to spinning. Yes, just spin. Don’t stop and admire your yarn in between each piece you complete and when you pick up another to join on. I tend to do that and it’s a time sink. Just spin, and spin, and spin. Take note of how long things take you to do. Getting the fibre onto the wrist so it’s out of the way was taking me too much time. I had to put down the spindle, grab the new fibre, wrap it around my wrist, pick up the spindle and get started again. I figured out a seamless way to grap the new fibre and tuck it into a knitted wrist distaff without having to stop and put down the spindle. That saved a minute or less. But when you figure that you are doing that several dozens of times – it starts to add up. I also noticed that winding on takes time. And there is the temptation to spin a long amount, but then when you wind that on, in order to keep it under tension I’d have to butterfly it until I can comfortably grab the spindle. So for me, I was more efficient to spin an amount I can comfortably manage and then wind that on. Now here’s a rationale for having more than one spindle on hand! You can and I have on several occasions spun yarn using one spindle for the entire project. I spin singles one on the spindle and then wind it off into a neat, hard ball. Then I spin singles two using the same spindle. When that is done I wind that singles, along with the singles from the first spinning (the one that is sitting neatly in a hard ball) into a double stranded ball. It is this ball I use for plying. Working with more than one spindle allowed me to save time winding off the singles yarn. I filled spindle one. Then I filled spindle two. I put both of them into the lazy kate and wound my double stranded ball from both spindles – it took 20 full minutes. I am sure I will think up a few more things that made this go faster. But that’s it for now. I am going to wash the skein and will measure it again for the final total. Have a great long weekend, and thanks for reading. 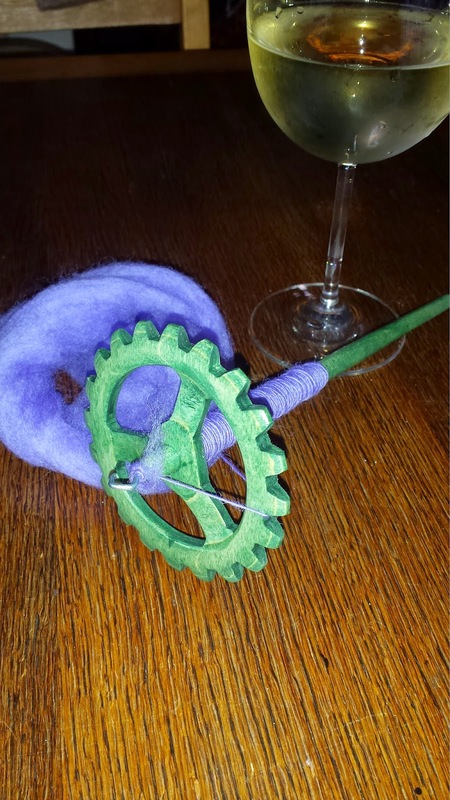 This entry was posted in corriedale, drop spinning, fibre club, spindling, spinning, steampunk, Uncategorized on May 17, 2015 by DianaTwiss. My spindle maker has recently revived an old passion – music. As a result he is making fewer, and fewer spindles. Every time I offer a spindling workshop I cross my fingers that he will agree to make the 8 – 12 spindles that I order. So far he has not let me down. But I also want to respect that his passion for this is waning and don’t’ want him to be obliged. Thus I am hunting for a new spindle maker. The spindles that I use in my workshops are a large part of the reason why participants leave after 3 – 4 hours spinning successfully. The spindles are perfectly balanced, have a hook that is always easy to find, a notch right across from the hook, and a tapered shaft that gives the spindler a couple of gears. So this is a hard act to follow. The other night I started my search by cruising on Etsy. I could never have imagined how many spindles there are on Etsy. But there they all were. I cruised around, clicked, read, clicked again and then came across the Steampunk Spindle by SnyderSpindles. I had seen it earlier in the year when he just developed them. I love the look of them and from the reviews, I figured they were worth a piece of my R & D budget. So I ordered one. Then I saw that they were two different weights, so I ordered one in each weight. It didn’t impact the shipping charge much from just one spindle. And then I saw one that was done in a green-ish stain, so I ordered that one too. I now have three Steampunk Spindles, two light-weight and one medium weight. I’m spending my spinning time this weekend test driving/spinning them. So far, I like their action. I especially like their look with the funky gear cut outs on the rim that actually have a function as over a dozen notches. The ultimate test is how they behave as they get more and more fibre on them. Will let you know. I haven’t given up on my spindle guy. I love the fact that he is local. But in the event that he is moving on, I need to find a good alternative. And besides, the research is fun! This entry was posted in steampunk, top whorl spindles on November 2, 2014 by DianaTwiss.